Bringing out the Miss Universe in me! Why not, it's not everyday I get to do this! We're very excited. The beautiful ladies of Miss Universe 2016 will be in Davao City on January 19, 2017. They will be in town as part of Miss Universe in the Philippines ancillary activities. The ladies will showcase the rich cultural tapestry in distinctive fashion and style of Mindanao on the runway. At least 10 homegrown designers were tapped to do their Mindanaoan masterpieces that will be showcased in Miss Universe Mindanao Tapestry Fashion Show. The show sells tickets and the proceeds will go to a beneficiary. You will have a chance to get it for free, however, just by joining this very simple and fun contest. Phoenix Petroleum Philippines, also a home-grown brand is the presenter of Miss Universe 2016 Davao Ancillary activities. They're running a contest up to January 18 for you to get a chance to witness the ladies on the runway. Here's what you're going to do! 1. 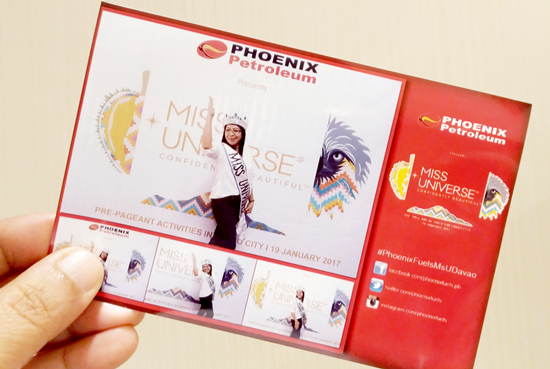 Have your picture taken at the Phoenix Ms Universe Photo Wall booth found at SM Lanang atrium. 2. Like the official Phoenix Petroleum Philippines Page on FB and follow @phoenixfuels on Instagram. 4. Submit your entries via PM on Facebook and DM on Instagram with your phone number. 5. Entries with the most number of likes on Instagram will win two Bronze tickets and the most number of shares on Facebook will win two Gold tickets. Please make sure that shares must also be public so we can verify and count. Sharing your entry in your own timeline is not allowed and will not be counted. 6. Submission of entries is from January 14 – 18, 12nn. Have fun everyone and bring out the Miss Universe in you!